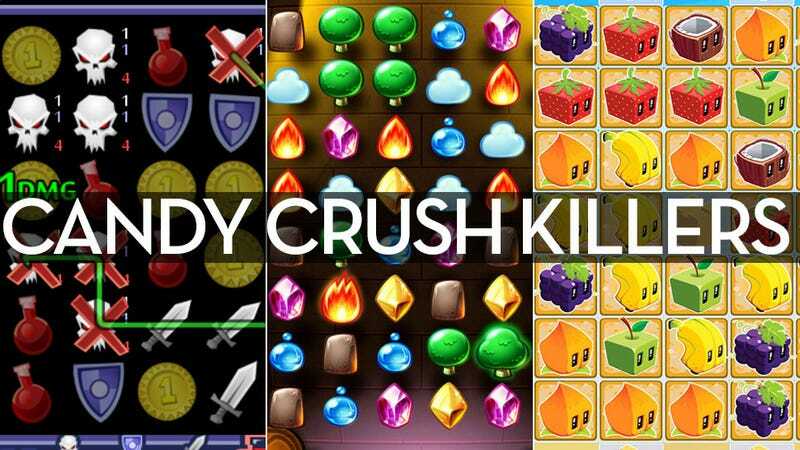 2013 was the year of Candy Crush Saga. It was on television, in music videos, and — most importantly — it was in the hearts and minds of millions of mobile gamers around the globe. Let's see if one of these ten alternatives can't dislodge it. I probably played Candy Crush Saga more than any other game last year. There were times it was the spackle that held my day together, filling in every little crack with a tiny dose of gaming. Well now I've had enough of those little pieces of candy drawing me in with their bright colors and then punishing my rapt attention with seemingly impossible levels. Join me in throwing off the shackles of Candy Crush Saga and replacing them with different, better shackles. Just pick your poison. From the makers of Candy Crush Saga, Farm Heroes Saga is as close as another entry in the Saga saga comes to matching the Candy Crush formula. Instead of candy, we're matching fruits and vegetables with eyes. Fresh elements like ice traps and special board zones that multiply the number of living plants you collect keep things fresh, but on the whole this is a very familiar experience. Developed by Pocket PlayLab and published under the Rovio Stars label, Juice Cubes is the game that most of my former Candy Crush Saga friends have flocked to as of late. It's incredibly tactile, the matching here, achieved by a combination of lovely effects and satisfying sounds. Instead of match 3, this is a line-matching game, and there's nothing better than taking out half the board in one fell sploosh. Bake Shop Drop takes more of a Tetris-like approach to matching. Cakes and pastries drop from the top of the screen, disappearing when matches are made, otherwise stacking. Should they reach the top, it's game over. The tension is quite delicious. It's Bejeweled! Remember? The game that set the whole match three genre in motion? There may be no quests, and no maps to traverse, but if you're looking for a quick (or extended) match three fix, there's still none better. Ready to take your matching skills to the next level? Keep telling yourself that. 7 Elements, not to be confused with any other numbers+elements games, takes standard match three gameplay and adds a heady twist — you can move more than one piece at a time. In fact, you can move up to three, making it easy to match large groups, if you can wrap your mind around the concept. Quick rounds and really pretty effects round out this brain-taxing variant. 4 Elements and its sequel, 4 Elements II, transform the gem-matching genre into an extended quests, mixes in some special powers, maybe a little hidden object adventure gameplay — it's several different casual games in one. It's kind of magical. The Puzzle Quest series adds magical fantasy combat to the match three mix, creating a puzzle/role-playing game hybrid that's almost a genre unto itself. In Candy Crush Saga you move down a set path to progress. In Puzzle Quest 2 you roam a dungeon, gaining experience points and new skills while taking down increasingly dangerous creatures. It's double dorky, in a wonderful way. Another role-playing puzzle game, but this one cuts out all of the unimportant junk, like, for instance, story. Dungeon Raid is all about upgrading stats, amassing powerful equipment, and just basically surviving until you inevitably succumb to powerful skulls. Skulls are jerks. Then you start over, maybe unlocking a new class or race. Next thing you know it's next Tuesday and you smell horrible. Again with the role-playing, only this time instead of playing the hero, you're controlling a squad of color-coded monsters you've won or purchased from random monster generating machines. You cultivate a team of these creatures, mating and evolving them so they can accompany you on increasingly perilous adventures. The action is match three, and the colors you match determine which creatures attack. It's very fancy. When you're done with messing around with gems, why not try matching a whole town? Triple Town's bushes and buildings do not disappear when you match them together. They grow larger. Grass becomes bushes, bushes become trees. Eventually you've got a whole kingdom to call your own — a kingdom threatened by giant bears, but what kingdom isn't? Have you already thrown off the yolk of sugary enslavement via some other mobile matching game? Testify in the comments below.